Are Dental Implants Better Than Other Options? You Bet They Are! Did you know that one of the first attempts at replacing teeth was using bamboo pegs in China 4,000 years ago? Thankfully, dentistry has come a long way since then! 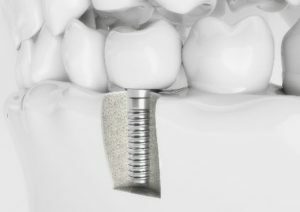 The first modern implant was used in 1965 and they’ve continued to improve ever since. In fact, they offer superior results over other options, such as dentures, because they look and feel much more like natural teeth. So if you’re interested in dental implants and would like to know what sets them apart, keep reading to learn more! Before we talk about the many advantages of implants, we’ll discuss what makes them different. Other options, like dentures and bridges, only replace the crown portion of the missing teeth, not the roots. Implants use a titanium post as a replacement root, which is the crucial difference that gives them such incredible strength, stability and chewing power. Longevity – With basic care and maintenance, implants can last several decades or even a lifetime. This makes them very cost-efficient in the long-term! Implants look and feel natural – Implants don’t shift around or stop fitting like dentures can, so they feel more like your own teeth. As for appearance, the crown of the implant will be precisely matched to the shape and color of your existing teeth, so it will seamlessly blend in with the rest of your smile. The shape of your face is maintained – When the roots of the teeth are missing the body reabsorbs some of the jawbone, which leads to a sunken in appearance in the face. Implants trick the body into maintaining the bone and facial structure. Speech – You won’t have any embarrassing slips during conversation the way you can with dentures! Diet – You won’t have to worry about avoiding your favorite foods with implants because your chewing power will be nearly what it was before losing teeth. Maintenance – Implants don’t get cavities! It’s still important to keep the gum tissue around them clean and healthy, but they aren’t subject to decay like natural teeth. High success rate – The success rate of implants is about 98% for non-smokers. You can rest assured knowing that you’ll get a predictable result! Your natural teeth are protected – With a bridge, the healthy teeth on either side of the missing space must be ground down to accommodate the two end crowns of the bridge. With implants, the adjacent teeth don’t need to be touched at all. Dental implants are an outstanding solution for replacing your teeth that feel so natural, you might forget you ever lost teeth to begin with! Dr. C.J. Landry is an implant dentist who understands the impact that missing teeth can have on someone’s life. He loves being able to offer modern options like dental implants because he knows that they offer the most natural result. If you have any questions, he can be reached through his website or at (504) 348-0080. Comments Off on Are Dental Implants Better Than Other Options? You Bet They Are!